Amber fossil resin has been used for centuries around the world for it’s anti-inflammatory properties. Fits most children age 3 months to 3 years. It’s believed that trace amounts of oil containing succinc acid are released from the resin when warmed by the body and then absorbed into the skin. Always remove the necklace from your child while sleeping, bathing, lotioning, or when unattended. 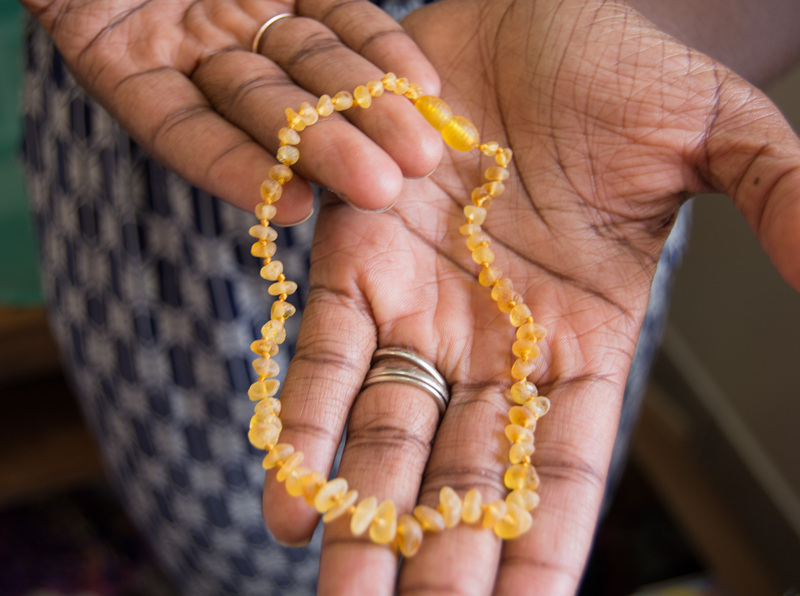 Amber necklaces are not to be chewed on or placed in the mouth. They are intended to rest against the skin. Please inspect your child’s necklace regularly and discard if chipped or damaged. The stones have been individually knotted and are secured with a safety release clasp. This means that when enough tension is applied the necklace will unclasp; it isn’t broken though. IMPORTANT: No specific results can be guaranteed. Please supervise your child at all times while wearing their necklace. Upon purchase parents assume full responsibility for their child’s safety and well being while wearing or handling the necklace. Anjelica Malone will not be held responsible for any mishaps.